Hot off the heels of the Shark Tooth 10K yesterday, I went into today’s race with a bit of an undecided approach as to time goals. I knew that my mileage base was low, and my legs were a little tired from the day before, but it’d also be a good opportunity to gauge my fitness level during “maintenance mode” time before marathon training kicks off. The weather was nice – low temperatures in the high 60s, but, signature Florida humidity was already in the air before the 7 AM race start. Still, nothing beat those gorgeous views of the sun breaking through the clouds as we lined up on our way to conquer 13.1! This race did not have corrals, but instead, suggested areas to line up, according to the pacers interspersed in the crowd. I worked on fighting up to the front, but got a bit too overzealous and found myself in the FRONT. Like, wayy front. At that point, I tried to move back and to the side, but before I knew it, the anthem was playing, then the gun went off! So…there I was, starting the race with the fasties. That was definitely a thrill. Of course, I dropped to the right, and right around the Mile 1 marker, the 1:40 pacer passed me. Whew! 1:40 is in my future, but not today. I actually felt relieved to see more people in front of me…it was a weird feeling to not have a crowd of people to follow! The course wound around the park/downtown area before taking to the first (of two) big bridges. 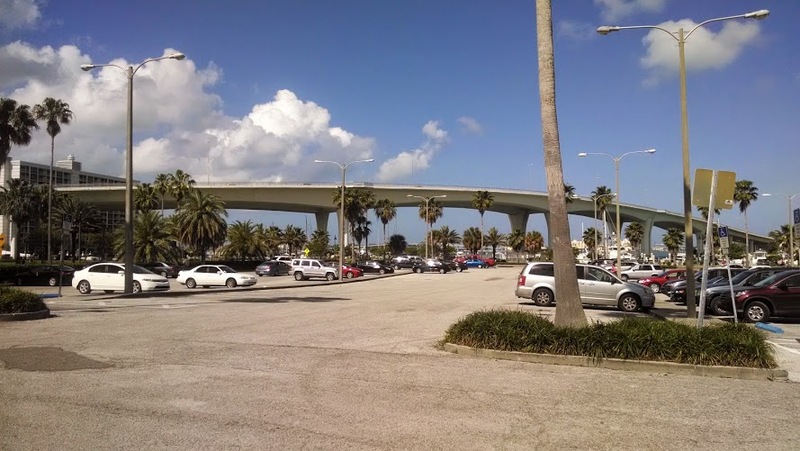 The bridge wasn’t as long as the Ringling Causeway in Sarasota, but it was steeper. I maintained effort and was able to get over the bridge fine that first go, and just kept going down the long straightaway to the beachfront area, then over another bridge and around (and through) a park – where we encountered a bagpiper who was playing the Olympics theme song…that was pretty cool! It was also around this time that I started to feel a little tired – I don’t know if it was the mix of the bridge running, keeping focused on the narrow course (we were running the shoulder) or the small stress of feeling the 1:50 pacer right behind me, but I was still hitting a pretty good groove, so I kept going. We had a turnaround point, then pushed on back toward the direction in which we had come. I loved this part because we could see the runners going out to the turnaround here! I saw Jen (yay! 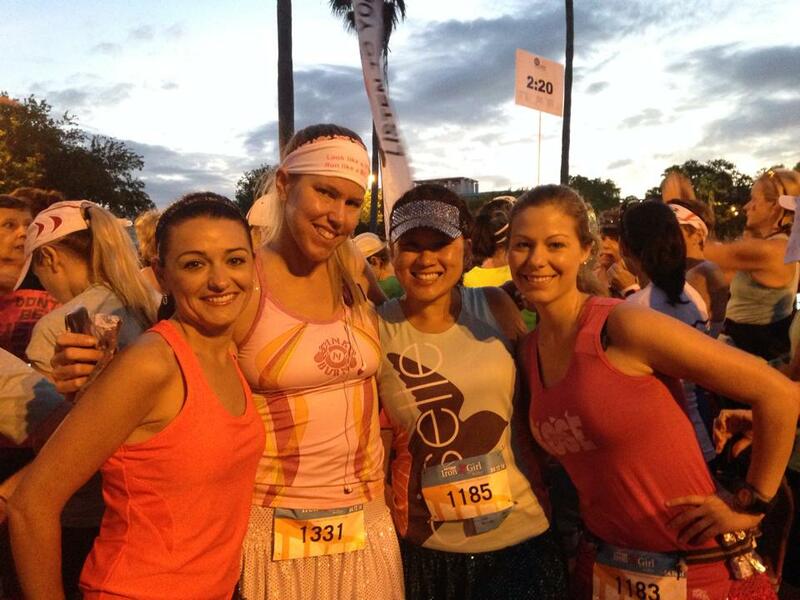 ), Tia (who was pacing the 2:30 group), Megan, Meredith, Jen and…Jen! Apparently, I have a lot of friends named Jen 🙂 It was so nice to see familiar faces, and their smiles powered me up to face the bridge return. I had been stopping at all the water stations for water (or Gatorade) and even though I was sweating buckets, I guess it caught up with me because I needed a portapottie stop during Mile 9, where the 1:50 pacers officially passed me. I felt okay with that, but when I walked back out from my restroom break and saw them not too far ahead, I just made it a finishing goal to keep them in my field of vision. I took this pic as we walked back to the car, post-race. Finally, we had made it back to the big bridge (after running a nice path up to it, instead of the road) and you know what? My legs told me they needed a little break, so I listened! I knew that I could make up the time with my downhill (I love running downhill!) so I pulled to the right, and walked to the top of the bridge, then opened up on a controlled acceleration down (and around, and around, which felt like an airport parking garage ramp) and home free toward the finish line! It was one of the strongest finishes that I can recall, and I just couldn’t wipe the smile off my face as a volunteer put my medal around my neck! I was officially an IRON GIRL! Splits: 7:53, 8:06, 8:13, 8:46, 8:01, 8:30, 8:16, 8:29, 9:21 (portapottie break), 8:31, 8:03, 8:36, 8:52, last bit (measured under .1, 6 min pace). Official finish: 1:49:50. 51st overall (out of 1229 finishers), 10th AG (out of 204). This was my 15th half marathon, 4th best time, and definitely a great way to spend a sunny April Sunday morning! It was so great to see friends (and even meet new ones IRL, Heyyyyy Ann and Beth (BoB)). I’d definitely recommend this race to anyone (well, anyWOMAN, as it is female-only!!) looking for a great challenge with a fantastic, encouraging atmosphere! 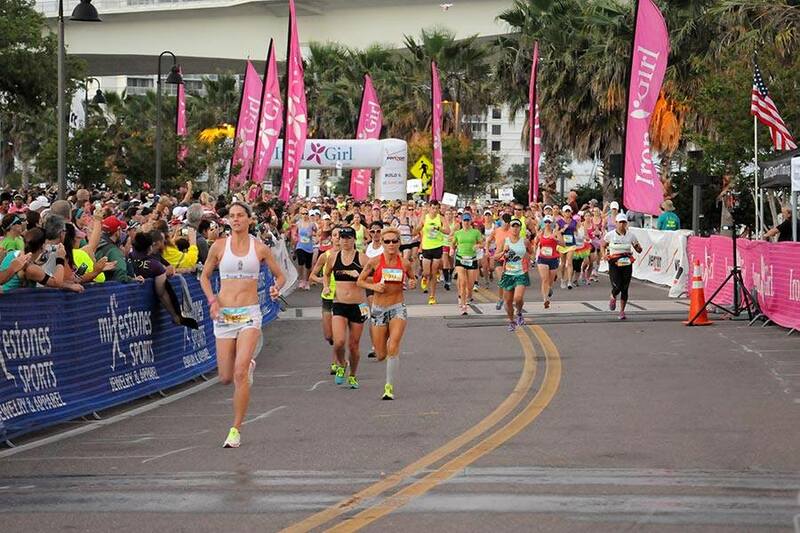 What’s your favorite half marathon? Why? CONGRATS!! You should have said HI! I was at the registration tent all morning! I’m so glad you had a great race and happy to hear you love the medals (they’re a new personal favorite of mine too!). Ahh I can’t believe i missed you, girl!! We were some of those morning-of packet pickupers 😉 You all should be proud, it was a great morning!! Way to go, Krissy! It looks like it was an absolutely amazing morning for a race! And the medal looks fabulous. Way to go Krissy! That is a beautiful medal! Thanks, K! It was so fun! Congrats- I’m not a fan of hills in races- I wish they were all flat! I ran a half marathon this weekend and there were some hills involved… and I wasn’t a fan 🙂 Finishing strong is a great accomplishment- enjoy the post race high! I am so weird and I’m the opposite…flat intimidates me so much!! Oh really- that’s so funny! It’s so interesting how we’re all drawn to different types of courses. What intimidates you about flat? I think it’s a mental thing…with hills, they have an up…and a down. Keeps my mind occupied, I guess? With flat, it’s hard to benchmark progress, maybe? Maybe I’m just crazy though!! Congrats sounds like a GREAT race and you had a GREAT run!! Congrats! 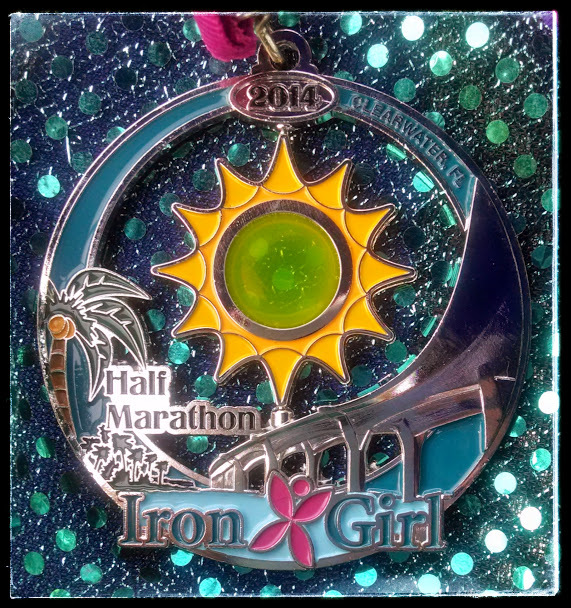 This looks like a great race and that medal is super cute! My favorite half was definitely the Princess! I loved this race! The bridges were tough for sure! Great bumping into u at bag check! Yes! It was great to meet you, girl. Hope you had a fantastic race!! !